The opening of Ai Weiwei’s (b. 1957 in Beijing, China) new installation, produced specifically for Kunsthal Charlottenborg and Copenhagen, took place on United Nations International Refugee Day (June 20 2017). 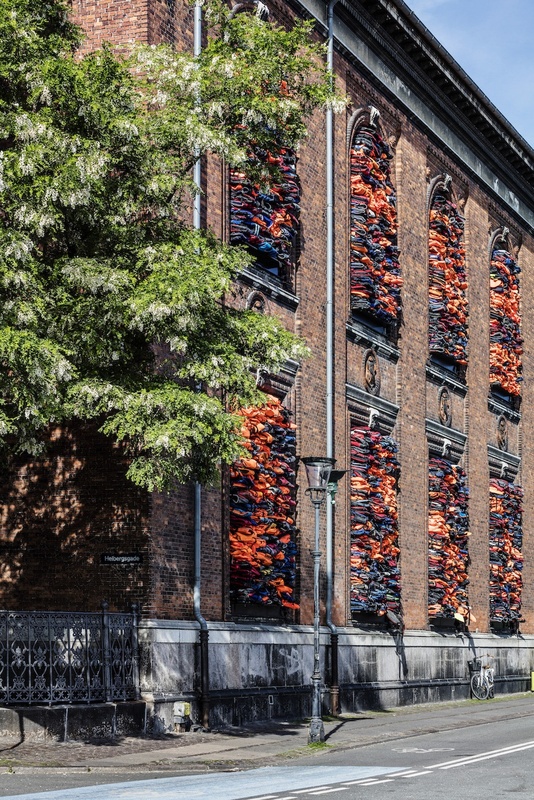 Named Soleil Levant, the installation barricades the windows of Kunsthal Charlottenborg with more than 3’500 salvaged life jackets collected from refugees arriving at the Greek Island of Lesbos. With this installation, Ai Weiwei hopes to bring focus to the refugee crisis currently taking place across Europe. According to UNHCR, 1’377’349 individuals arrived in Europe via sea in 2015 and 2016. In the same period, over 8000 individuals have died or disappeared attempting this journey. It is the wide-spread humanitarian crisis, which Ai Weiwei aims to bring focus on. The name of the work stems from Claude Monet’s painting Impression, Soleil Levant from 1872, which depicts the harbour in Le Havre at the end of the 1870-71 Franco-Prussian war. Whereas Monet’s landscape painting captures the political and social reality of its time with its cranes, steamboats and industrialisation, Ai Weiwei’s Soleil Levant draws attention to the political and social reality of today through refugee lifejackets. Ai Weiwei is one of the most respected living artists in the world today. His work – across sculpture, architecture, installations, music, photography and film – always challenge and encourage critical debate. He has previously exhibited at ARoS, Louisiana and Arken in Denmark, where his works are also part of the museums’ permanent collections. In 2011, Ai Weiwei was detained in China for 81 days without charges and had his passport confiscated. He did not get his passport back from the government until 2015. Since relocating to Berlin following the return of his passport, many of the artist’s latest works focus on the refugee crisis of present-day Europe. The installation Soleil Levant for Kunsthal Charlottenborg officially opens on United Nations World Refugee Day, (June 20) and will be on view at the facade of Kunsthal Charlottenborg until the October 1 2017. The project is curated by Luise Faurschou from ART 2030 and Michael Thouber from Kunsthal Charlottenborg. Press release of the Kunsthal Charlottenborg, Copenhagen. Image : Ai Weiwei, “Soleil Levant”, 2017. Installation view, Kunsthal Charlottenborg, 2017. Life jackets in front of windows of facade. Courtesy of the artist. Photo by Anders Sune Berg.